GPT projects: The projects listed below have been carried out by Pulsar Physics on a contract basis using our General Particle Tracer (GPT) code. They sometimes involve extreme beam conditions and therefore do not necessarily represent typical GPT applications.If you have any questions about these projects, please contact info@pulsar.nl. Ultrafast Electron Diffraction (UED) is an indispensable tool for the study of molecular dynamics and ultrafast chemistry. A number of research groups worldwide are using GPT for the design of a variety of UED sources. 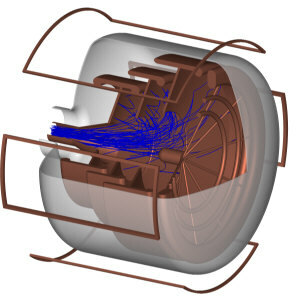 Shown on the left are detailed GPT simulation results for a 100 fC ellipsoidal 100 keV electron bunch, that is subsequently recompressed to 30 fs by an rf-cavity. Each and every electron has been tracked in 3D, through realistic fields, including space-charge. Uniformly charged ellipsoidal bunches, also known as waterbag bunches, have linear self-fields in all coordinates. 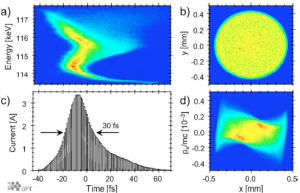 We discovered a practical method to produce such bunches based photoemission by a transversely shaped femtosecond laser pulse. The plot on the left shows the first GPT simulation result of a 'waterbag' bunch produced in a 1.5 cell 3 GHz cavity. Ultra-bright electron and ion bunches can be created by extracting a bunch from an ionized ultra-cold plasma. This process eliminates the 'hot' initial conditions of photo- and field-emission, leading to a potential increase in brightness by several orders of magnitude. A number of GPT simulations have been performed to study the feasibility of this approach. Three different S-band RF-photoguns have been constructed by Eindhoven University of Technology in the Netherlands: A 1.5-cell, a 100-Hz 1.6-cell, and a 2.6- cell. They share a design concept that differs from the ‘standard’ BNL-gun in many aspects: Individual cells are clamped and not brazed, saving valuable manufacturing time and allowing damaged parts to be replaced individually. The inner geometry employs axial incoupling, inspired by DESY, to eliminate any noncylindrically symmetric modes. Elliptical irises, identical to a 2.6-cell design of Strathclyde University, reduce the maximum field on the irises and thereby reduce electrical breakdown problems. The manufacturing process uses single-point diamond turning based on a micrometerprecise design. The overall precision is such that the clamped cavities are spot-on resonance and have nearperfect field balance without the need for any postproduction tuning. At Strathclyde University, Glasgow, the Alpha-X projects aims at the demonstration of controlled plasma acceleration, with the final goal to produce coherent short wavelength radiation. The plot on the left shows the bunch evolution inside the plasma channel, based on a linear model developed by Albert Reitsma. The "Rijnhuizen" Fusion Free-Electron Maser (FEM) is the prototype of a high power, 1 MW, electrostatic mm-wave source, tunable in the range 130-260 GHz. The electron beam line consists of an 80-keV, 12-A thermionic triode electron gun, a 2-MV electrostatic accelerator, an undulator and a waveguide resonator mounted in a high-voltage terminal, an electrostatic decelerator and a depressed collector. This entire system has been simulated with the GPT code. The plot on the left shows the depressed collector with sample electron trajectories.